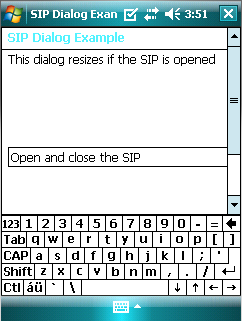 Sometimes it is necessary for a dialog to take the SIP into account, as the SIP may hide important input widgets. 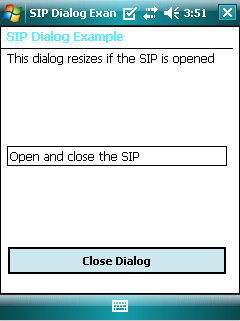 The SIP Dialog Example shows how a Dialog object, dialog, can be resized accordingly if the SIP is opened, by embedding the contents of dialog in a QScrollArea. The Dialog class is a subclass of QDialog that implements a public slot, desktopResized(), and a public function, reactToSIP(). Also, it holds a private instance of QRect, desktopGeometry. In the constructor of Dialog, we start by obtaining the available geometry of the screen with availableGeometry(). The parameter used is 0 to indicate that we require the primary screen. We set the window's title to "SIP Dialog Example" and declare a QScrollArea object, scrollArea. Next we instantiate a QGroupBox, groupBox, with scrollArea as its parent. The title of groupBox is also set to "SIP Dialog Example". A QGridLayout object, gridLayout, is then used as groupBox's layout. We create a QLineEdit, a QLabel and a QPushButton and we set the minimumWidth property to 220 pixels, respectively. Also, all three widgets' text are set accordingly. The verticalSpacing property of gridLayout is set based on the height of desktopGeometry. This is to adapt to the different form factors of Windows Mobile. Then, we add our widgets to the layout. The scrollArea's widget is set to groupBox. We use a QHBoxLayout object, layout, to contain scrollArea. The Dialog's layout is set to layout and the scroll area's horizontal scroll bar is turned off. QDesktopWidget's workAreaResized() signal to dialog's desktopResized() slot. The desktopResized() function accepts an integer, screen, corresponding to the screen's index. We only invoke reactToSIP() if screen is the primary screen (e.g. index = 0). The reactToSIP() function resizes dialog accordingly if the desktop's available geometry changed vertically, as this change signifies that the SIP may have been opened or closed. If the height has decreased, we unset the maximized window state. Otherwise, we set the maximized window state. Lastly, we update desktopGeometry to the desktop's available geometry. The main() function for the SIP Dialog example instantiates Dialog and invokes its exec() function. Note: Although this example uses a dialog, the techniques used here apply to all top-level widgets respectively.